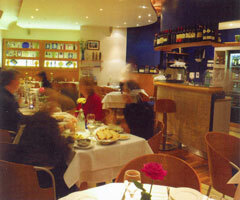 Getti is a new and vibrant Italian restaurant situated in heart of West End. With a modern and fresh design scheme and strong blue and white interiors, Getti’s ambience recreates the feeling and beauty of sunny Mediterranean, the primary source of the simple and fresh ingredients of Getti’s cooking. Indulge yourself at Getti Marylebone High Street for that special meal. Located at the upper end of chi-chi Marylebone Village, the distinctive cosy alcoves of this restaurant make it perfect for intimate romantic evenings or for important business lunches. Getti can accommodate large groups and have special party menus. The Private Rooms have been designed to enhance your dining experience whilst offering a variety of styles and locations to suit your needs. Whether booking a corporate event, press launch, business lunch, private party, drinks and canap�s parties or even weddings, the Private Dining facilities alongside individually designed menus will ensure your dining experience will be unmatched. The restaurant lends you a helping hand when it comes to organising your party. From the menu planning to writing the place cards for your guests, all the details are looked after by the restaurant. Getti offers dishes from a wide array of local traditions, from the North and the Po Valley to Sicily and Sardinia, and stands by the belief that recipes that have stood the test of time, refined by the palates of many generations, are worth respecting and renewing. Sourcing its ingredients from quality, highly regarded Italian producers and distributors, Getti now gives you the opportunity to experience the pleasure of Italian eating in London�s metropolitan heart. The restaurant can host a party of up to 118 people (sitting).